Last week I was enjoying balmy days and cool nights in the mountains of western North Carolina. Now I’m back in flat Florida, where temperatures are hovering near 100 degrees and the heat index has been as high as 114. I am thankful for air conditioning. I am also thankful that the work I need to do right now is paperwork, not dyeing. 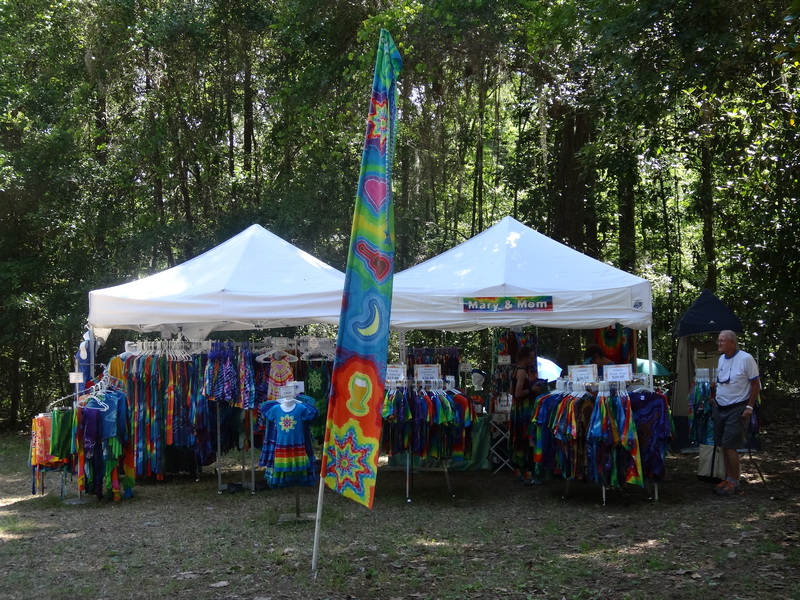 I need to finish my quarterly tie-dye inventory and get my sales taxes paid so I can go back to North Carolina. The deadline for the sales tax return is July twentieth, but I can’t procrastinate that long because I promised my sister I would be back in North Carolina in time for her house concert on the ninth. She has asked me to join her for part of that performance and throw in some harmony. I love vocal harmony and I love my sister, so I will not let her down. Of course, as soon as I got home with tons of paperwork on my agenda, our ancient printer decided to stop working. With a strange sound and a burning smell, it gave up the ghost and left me with no way to print out my inventory worksheets. My daughter may be willing to just write things down in a spiral notebook (she started counting things this way while I was out of town, God bless her), but I need my worksheets. Research was done and a new, faster printer was acquired. Now the inventory is progressing and I have high hopes of completing it and moving on to the sales taxes within the next couple of days. That’s good. Getting back to North Carolina in time for the house concert is imperative, but getting back in time to rehearse first is pretty important, too. Another thing that’s important is painting. I want to be painting. The last piece of the painting puzzle has finally fallen into place, thanks to my daughters. The younger one surprised the older one with a new sewing machine for Mothers’ Day. 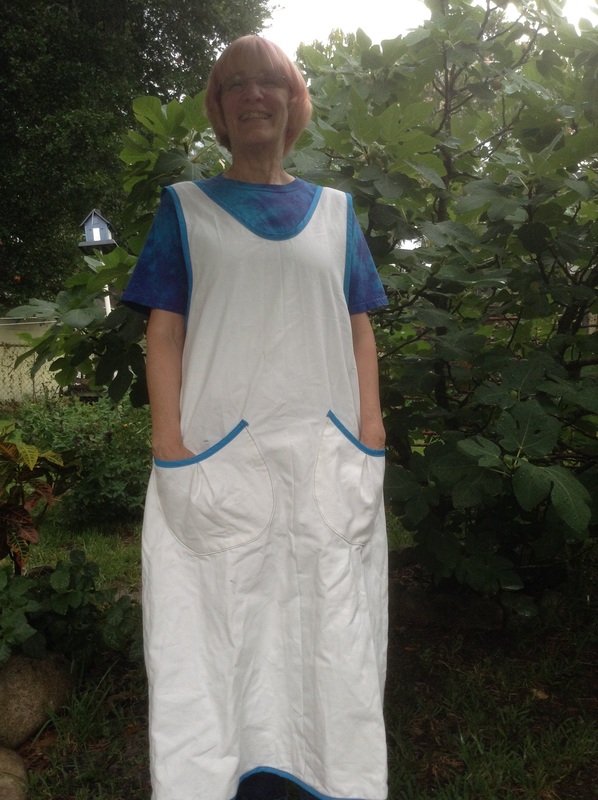 Then the older one used the new sewing machine to make me a painting apron. Now I won’t have to change into old tie-dyeing clothes when I want to paint. I can just throw on my apron over whatever I happen to be wearing and have at it, without worrying about getting paint on my clothes. Okay, it may not be the most flattering look for me, but I think it’s beautiful. This entry was posted in Uncategorized and tagged inventory, painting, paperwork, printer, Sales taxes on June 29, 2016 by releaf1954. My husband and I love to visit the Blue Ridge Mountains in June. Our wedding anniversary is in June and my husband has always scheduled time off so we could celebrate in our favorite part of the country. He retired last December, so time off is no longer an issue. That made it hard to decide exactly when to head to the mountains and even harder to decide when to head home, but the anniversary remains in June, so here we are. 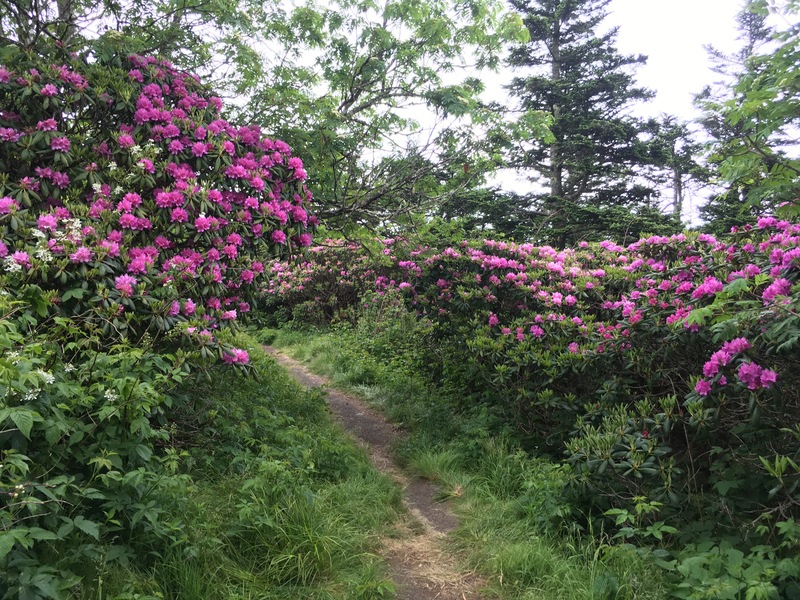 We have often visited Roan Mountain on our trips. 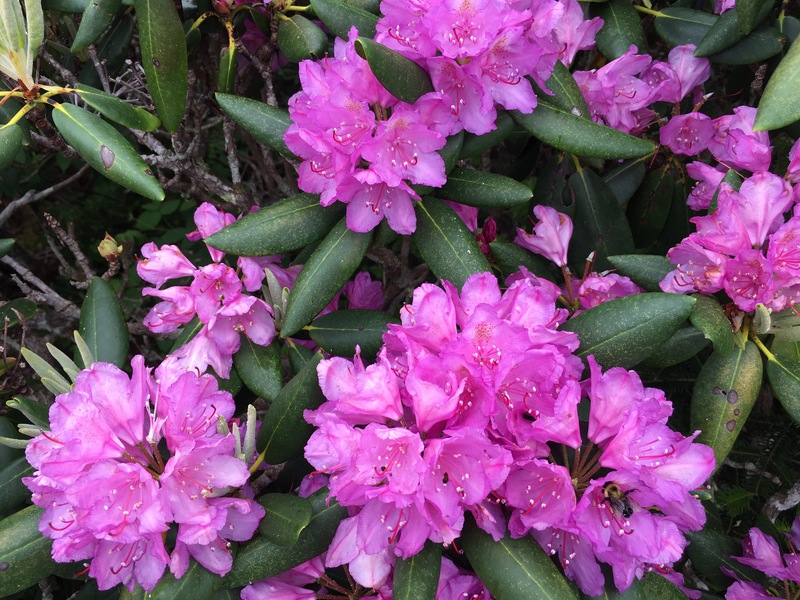 Sometimes we get there too early and the rhododendrons are not yet blooming. 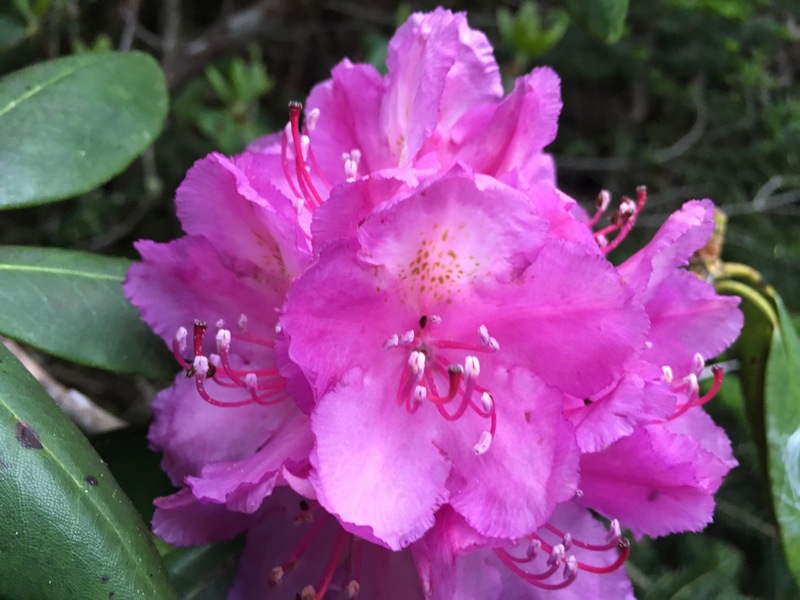 Sometimes we get there too late and most of the blooms have gone by. This year, we hit it just right. Could there be a more beautiful place for a picnic? 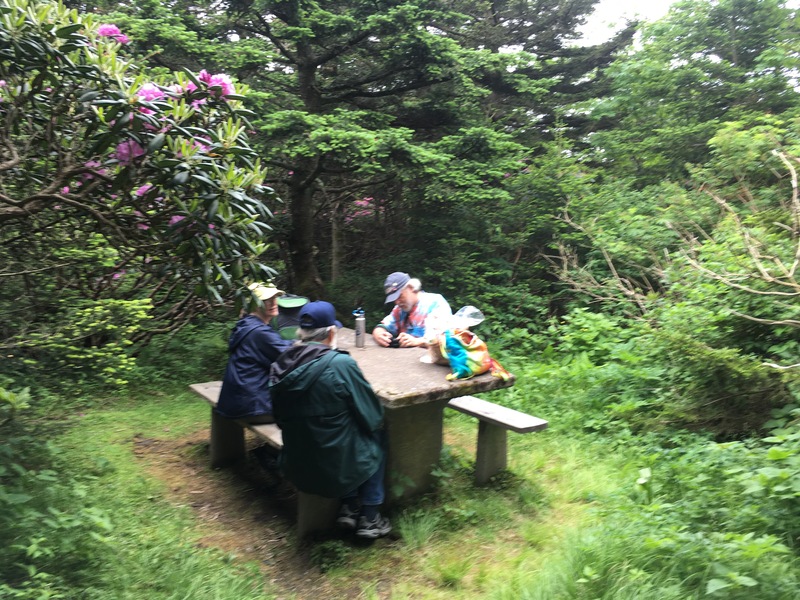 This entry was posted in Uncategorized and tagged Blue Ridge Mountains, picnic, rhododendrons, Roan Mountain on June 22, 2016 by releaf1954. I am weary this Wednesday. I know my readers are, too. It’s been a rough week. We all know what happened Sunday, when an angry man full of hate took an assault rifle to a gay club and opened fire on a room full of folks just trying to enjoy each other’s company and have a good time. My blog posts are usually pretty casual, with as much humor as I can put into them, so it’s hard for me to blog about something so horrible and so real, but it happened and it’s more than horrible and real to the families of the people who lost their lives in this senseless hate crime. Everyone is trying to make sense of it, of course. We want to find a reason and we want it to be something we can fix. Maybe we’ll finally do something about gun control now or maybe we’ll do something about mental health. These things need to be done, but my LGBT friends and family members are saying that we can’t just talk about assault weapons and mental health. We need to talk about our long history of treating them as less than human because they don’t love the way we love. That long history is evil and wrong. If you try to use your holy book to defend it, you are wrong. I am a quiet person who prefers to avoid controversy, but this is just not controversial for me any more. Love is the only thing that can save us. This entry was posted in Uncategorized on June 15, 2016 by releaf1954. When I was a young child, I lived in a small town in New Hampshire. One of my favorite memories from those years is of going out into the wilds with my mother and picking berries. We picked wild strawberries every Summer and made strawberry shortcake. We picked wild raspberries, too, One year, we picked a lot of chokecherries and my mom made chokecherry jelly. Chokecherries are incredibly sour, but if you add enough sugar to them, they make delicious jelly. When I was eight years old, we moved from a small town in New Hampshire to a big city in Florida. My mom was still one to look for wild berries and we found plenty of blackberries in the field behind our neighborhood convenience store. We spent some wonderful days out in that field, gathering berries and taking them home to make them into blackberry cobbler. Our big city did not have wild blueberries or strawberries, so we looked on the outskirts of town for U-pick farms. 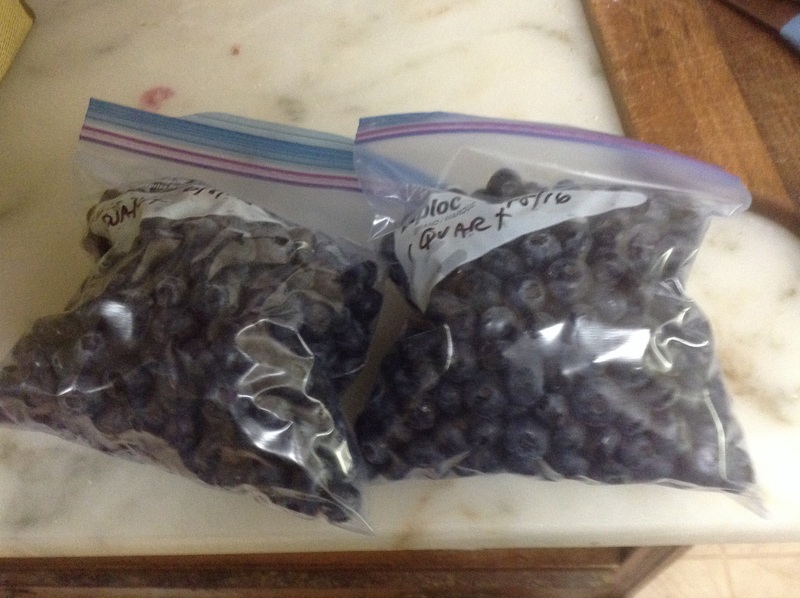 We used to go for long hours and pick pounds and pounds of berries to take home and freeze for later baking sprees. Back then, that was the economical way to acquire lots of berries when they were in season. Can someone tell me when the U-pick farms started charging people more to pick berries themselves than to buy them in the grocery store? In what universe does this make sense? If I’m doing the work of picking the berries, I expect to get a break on the price. That’s how it worked when I was young. Picking is work. I do it and that saves you the expense of paying someone else to do it. They have built houses in the field behind the old convenience store, so I don’t know where to go to pick wild berries any more. I also refuse to pay more to pick them at a U-pick farm than to buy them, already picked and boxed, at the grocery store. We don’t get pounds and pounds of them these days, but I always make sure to get enough for my Thanksgiving pies. Even if I don’t get to pick them myself, I always think of my mom and those wonderful wanderings when I pack berries away in the freezer. This entry was posted in Uncategorized and tagged berry-picking, blueberries, U-pick farms on June 8, 2016 by releaf1954. Well, it was bound to happen eventually. Yesterday was Wednesday and I didn’t blog. I don’t even have a good reason. I just forgot. I fought my way groggily from sleep this morning and then let out a big gasp that startled my poor husband. Then I had to explain that it was not that big of a deal, but that it was Thursday morning and I just realized that I hadn’t put up a blog post Wednesday. Okay, to me it’s kind of a big deal. I kept that Wednesday blog post going for more than a year and I wanted to keep it going indefinitely, but I guess some part of me wanted to let go of the obligation. Some part of me let me go to bed last night and sleep soundly without bringing up the fact that I had not put up a blog post. It sure wasn’t a matter of not having anything to blog about. 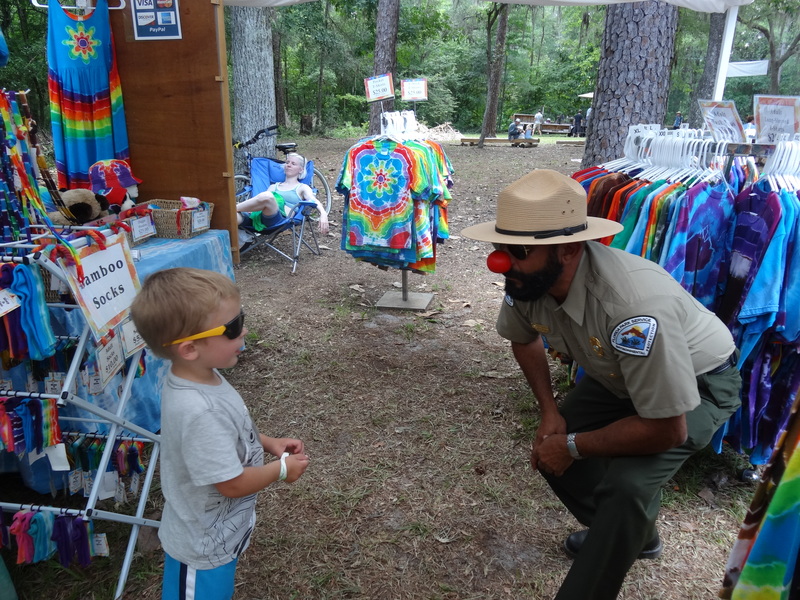 Between last Wednesday and this Wednesday, I survived an entire Florida Folk Festival. I sold tie-dye for three days. I left my daughter in charge of the tie-dye booth once each day so I could sing and yodel with the family act that’s been performing there since 1971. I saw lots of wonderful old friends and made some new ones. It was a busy week. I guess the intensity of the last month just finally caught up with me yesterday. I got lazy in the evening. I watched TV. I read a magazine. I ate leftovers for supper and I went to bed early. I slept peacefully for eight solid hours and then I woke up and gasped at the realization that Wednesday had passed and I had not blogged. Oh, well…it was bound to happen eventually. 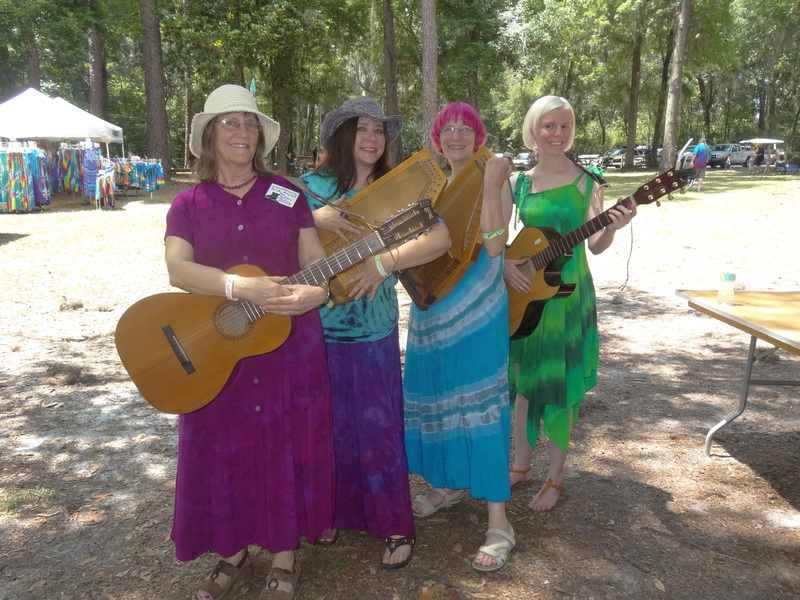 This entry was posted in Uncategorized and tagged Florida Folk Festival, The Makley Family, tie-dye on June 2, 2016 by releaf1954.